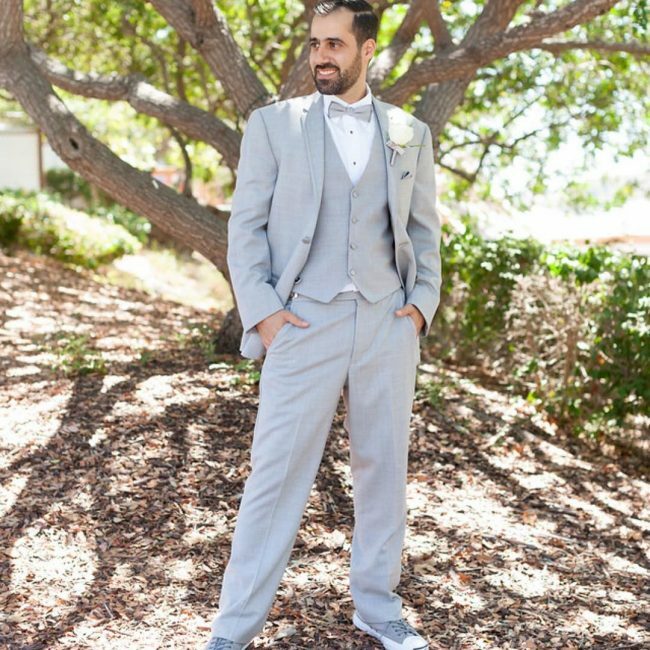 Light gray is one of the popular colors in warmer climates. 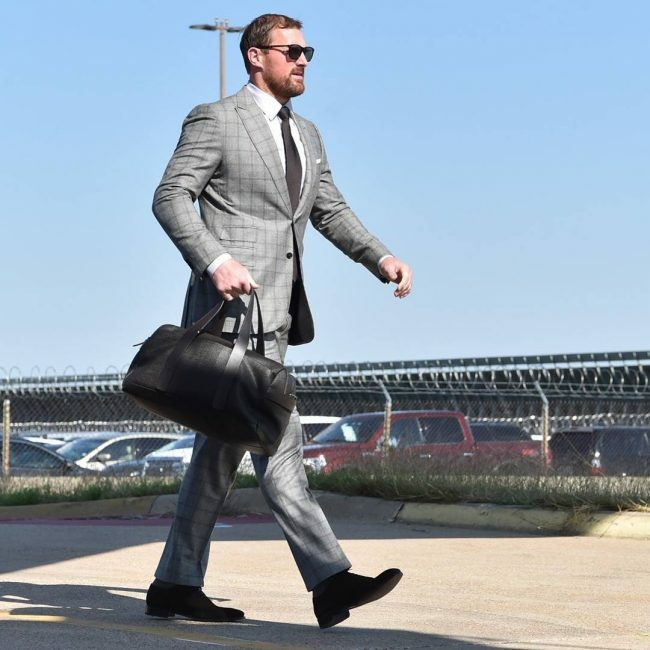 Also when it comes to fashion, there is nothing that beats a light gray suit. 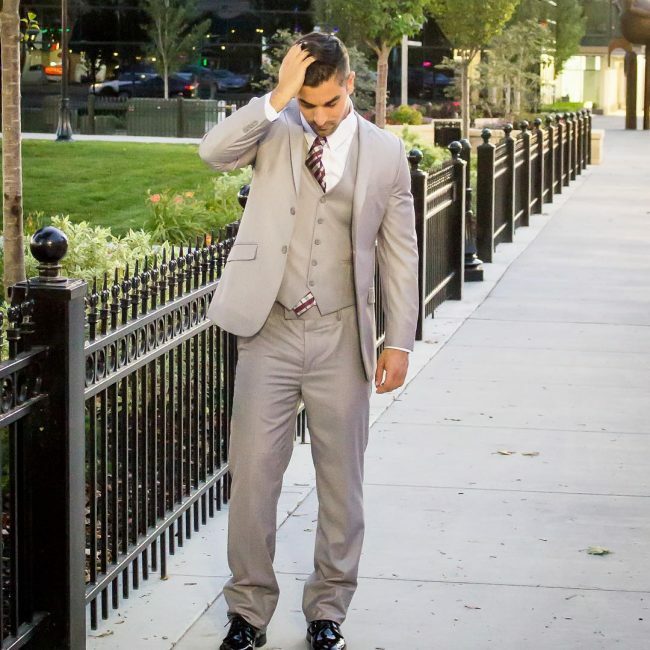 These suits have always had a general popularity because of their versatility and adaptability. 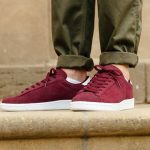 They are also more prevalent in street style, especially appealing to the younger individuals. 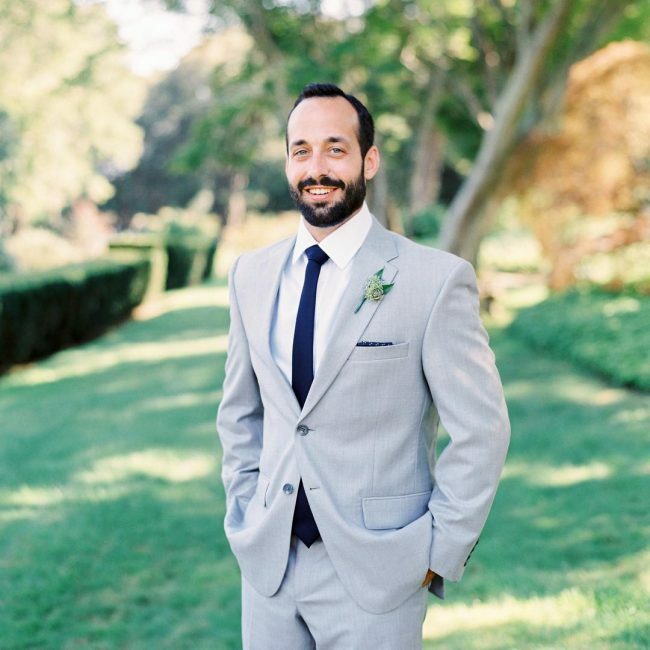 Here are 45 light gray suit ideas you can try this holiday. 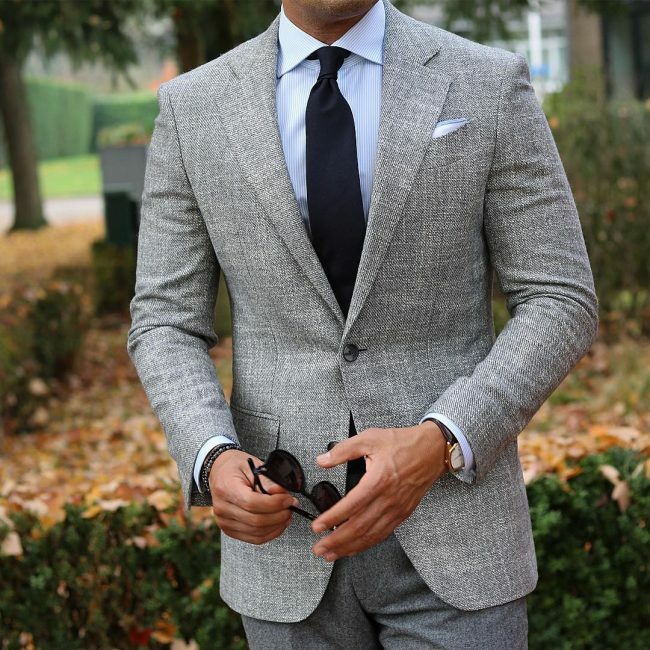 You will rarely find a patterned gray suit. 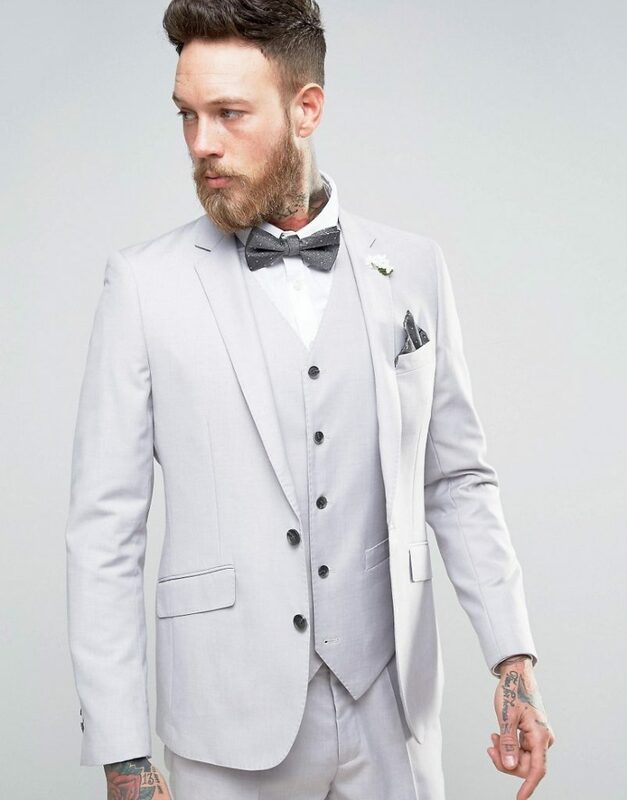 The main reason is that any aggressively patterned suit reduces its formality. So here you will need to try a lightly patterned one. 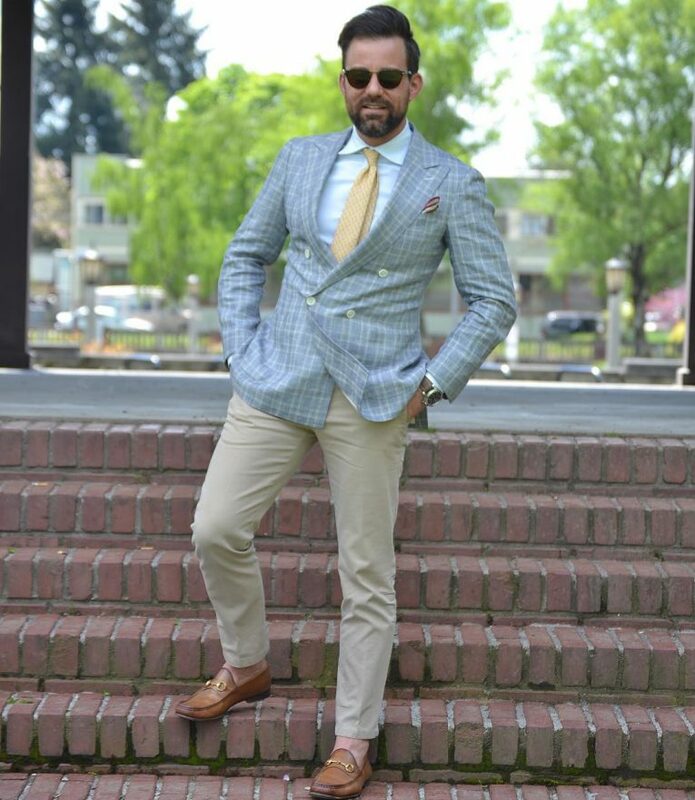 A three piece suit of this color choice is one of the most versatile and useful items a man can own in his wardrobe. 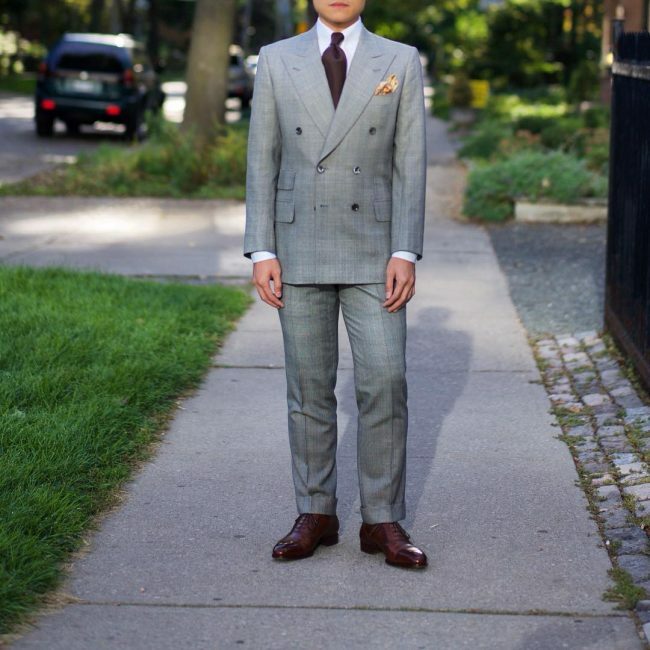 If you want to be an elegant gentleman, try a three-piece suit. 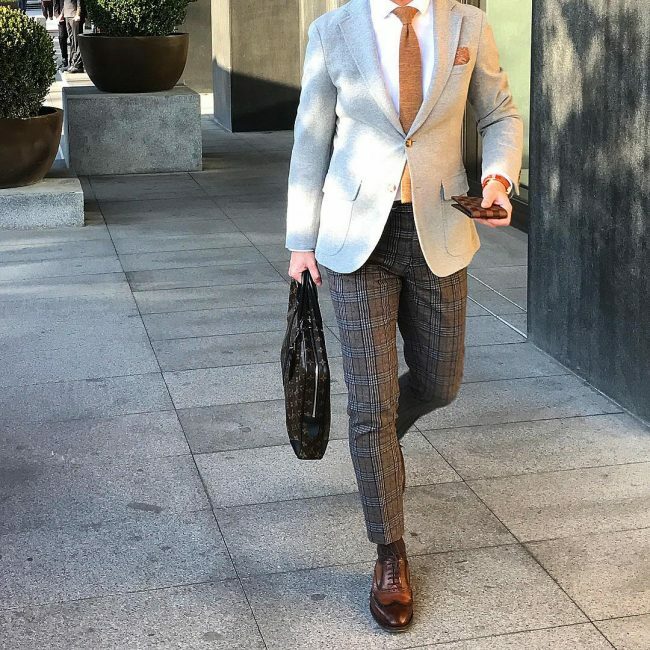 You can wear your suit with a white shirt and break the color with ties in any shade of brown including auburn brown, beige, tan or chocolate. 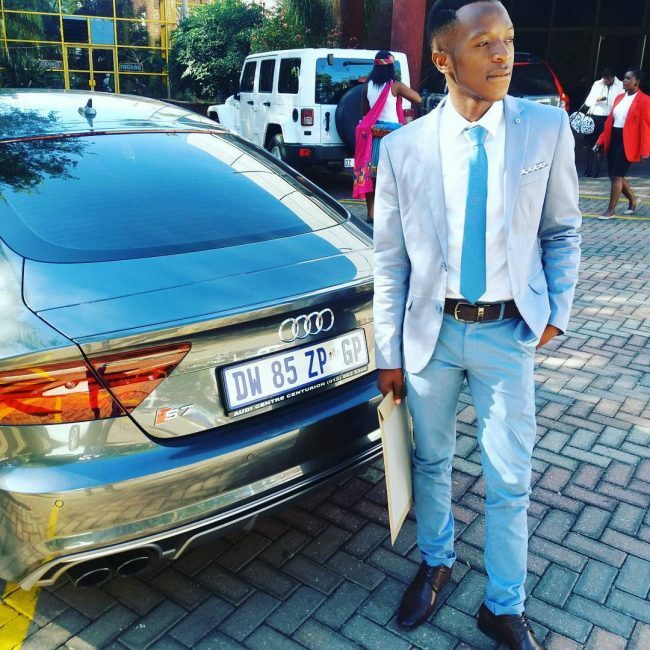 The tie can be of any design from skinny to cut ties. Color mixing can be tricky if you don’t have enough ideas. 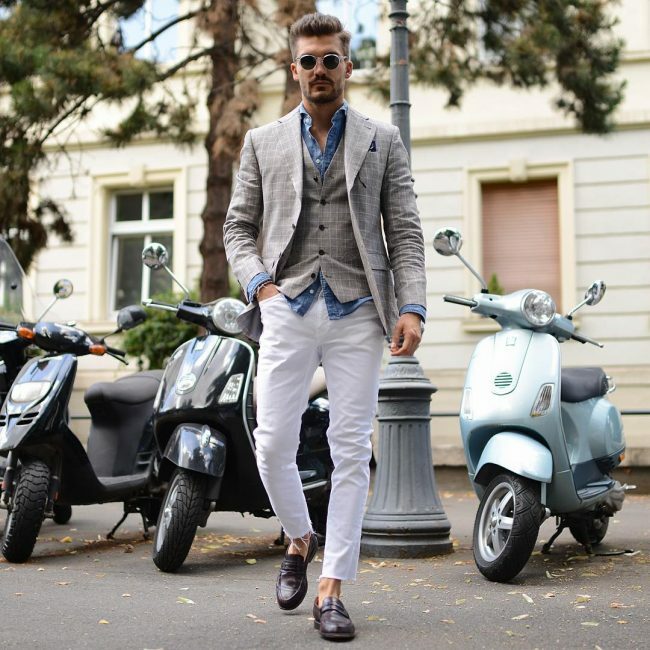 Try ultra-medium fitting trousers and blazers if you want to attain that mix and match style. 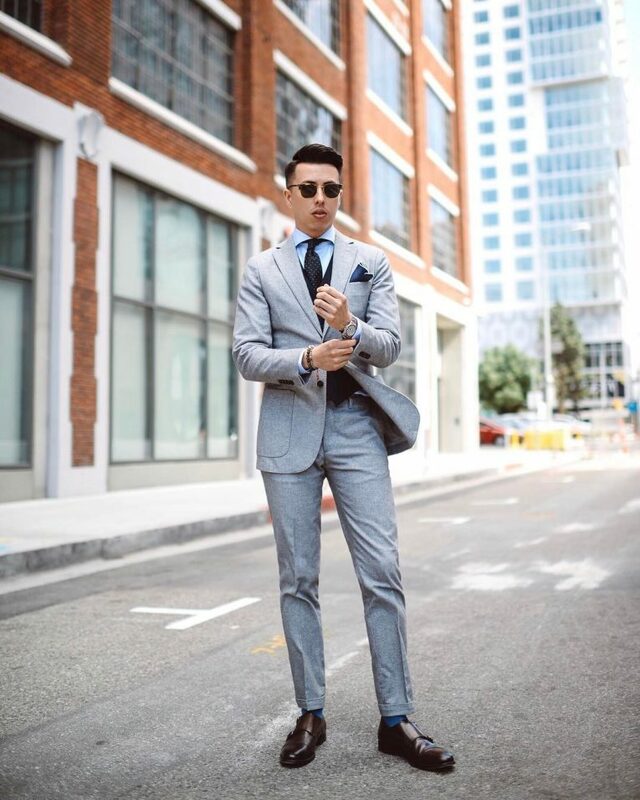 A gray suit with a collarless shirt is the season’s style that you must try. 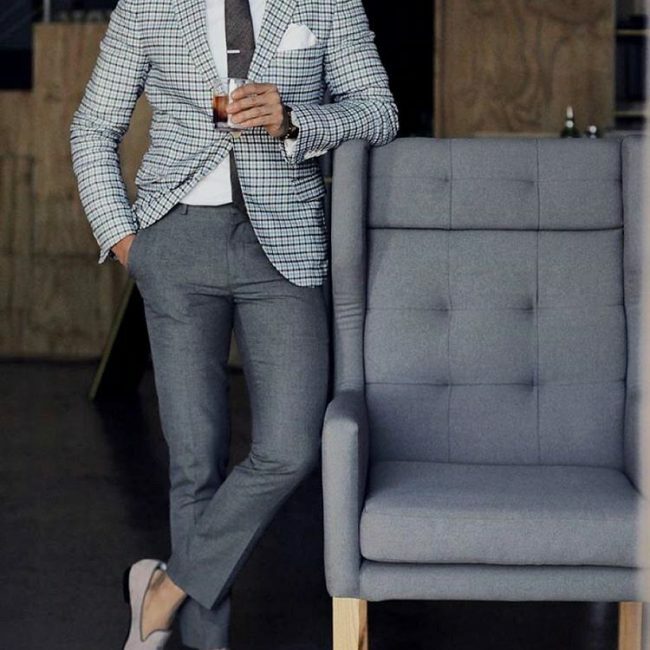 The collarless shirt design gives this suit a subtle upgrade. Black-and-white combinations are both bold and classic. You don’t need to worry because they work for any event on your calendar. 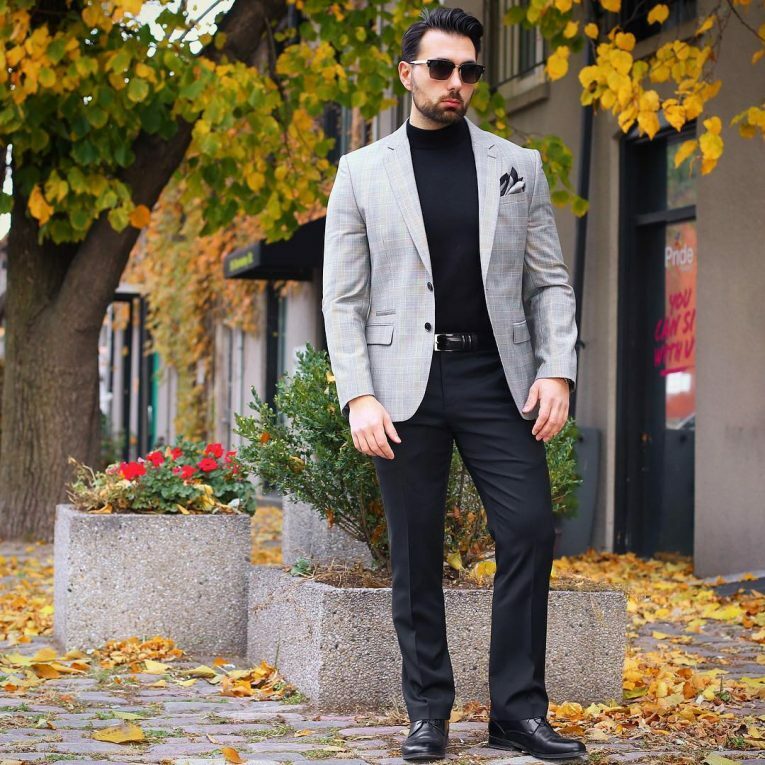 Pump up your patterned blazer with a black skinny trouser, white shirt, and black neck tie. A gray plain double-breasted suit with white shirt, red tie, and a red pocket flower is a style that was popular in the 1980s but still rocks. 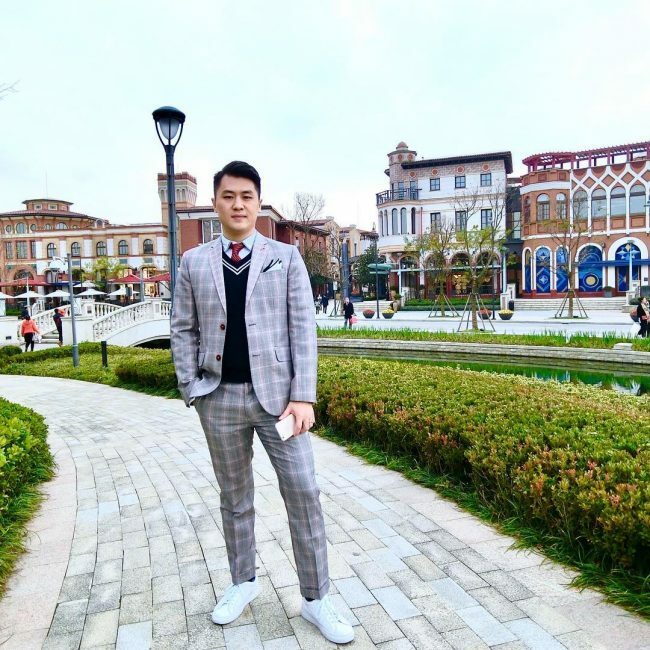 It is always a bold statement when gentlemen wear patterned outfits. 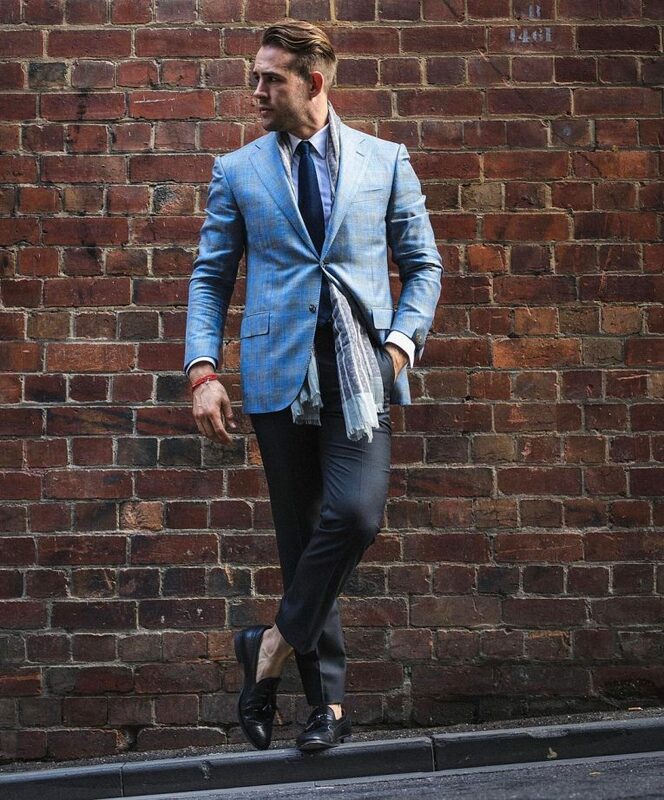 You can try to wear a square pattern suit and combine with a pop of color in pocket square or neck tie. 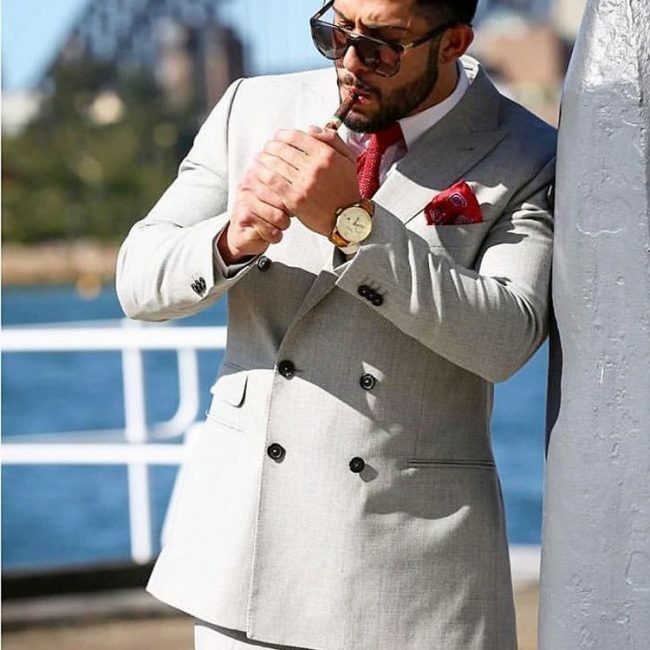 These suits always go well with white or cream shirts but other color shirt options are endless. 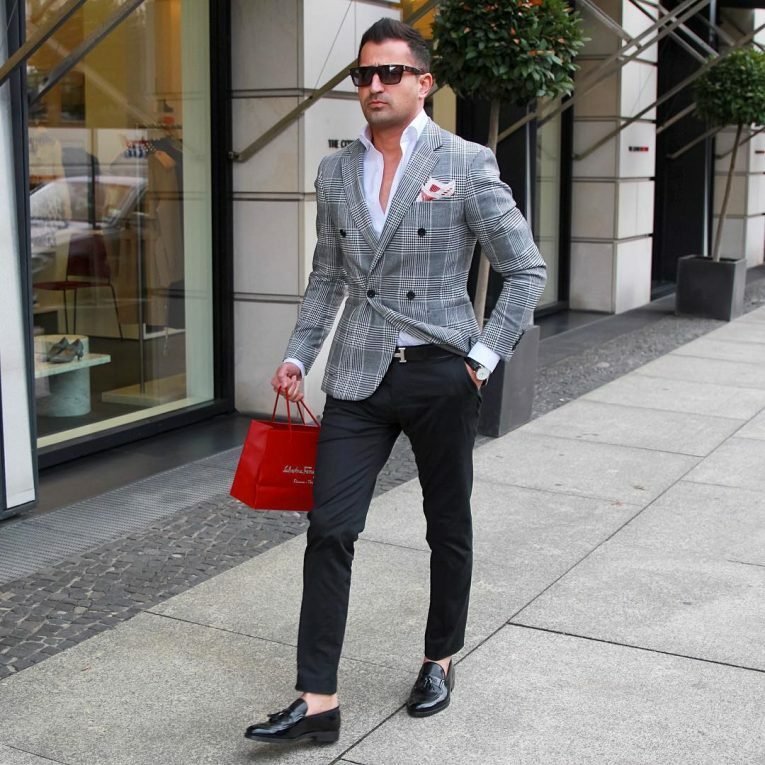 Try this style to show your employers that you are confident. Most men are confused on how to wear their scarf properly. The good thing is that they are appropriate with almost all outfits including suits so there is no need to be baffled. 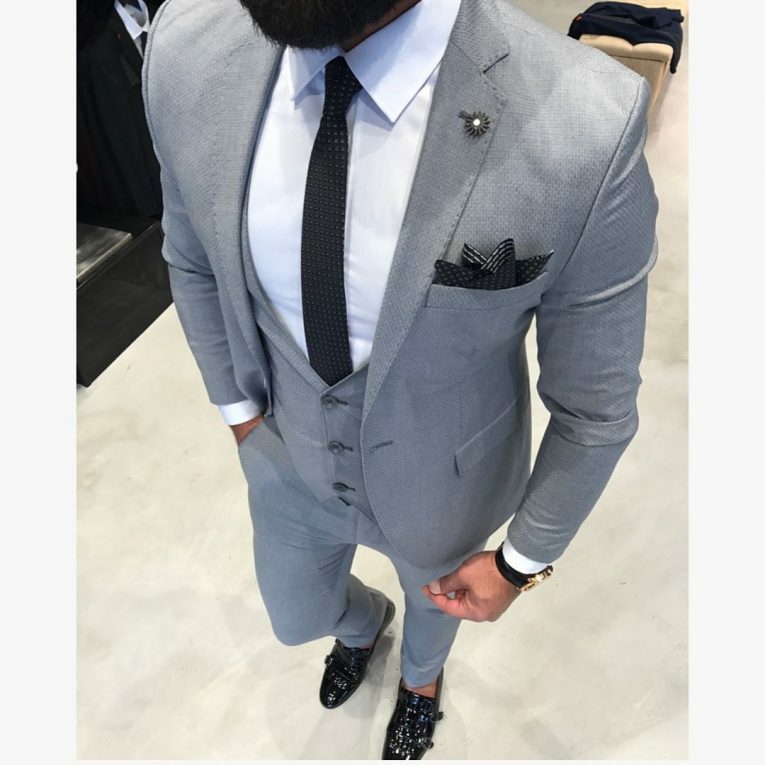 So you are going to ask what tie to wear with your light gray suit. 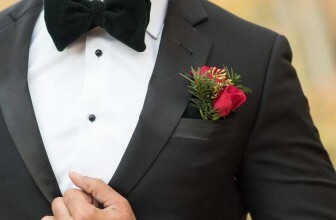 Wear designer black tie with your suit whenever you want to make a statement. It’s that simple. Green neck ties are often regarded as distracting and difficult to find matching outfits. A green cut or skinny tie can also do the trick. 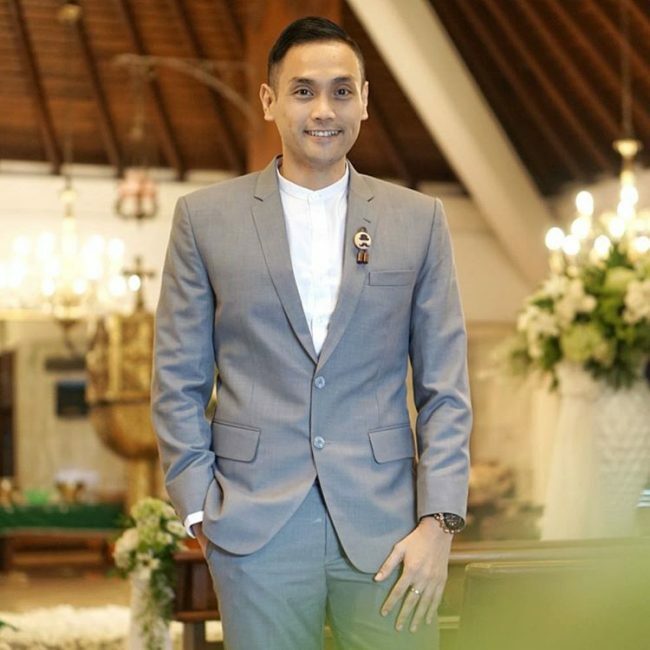 In this style, you wear a three piece suit (blazer and waistcoat only) with a denim shirt. 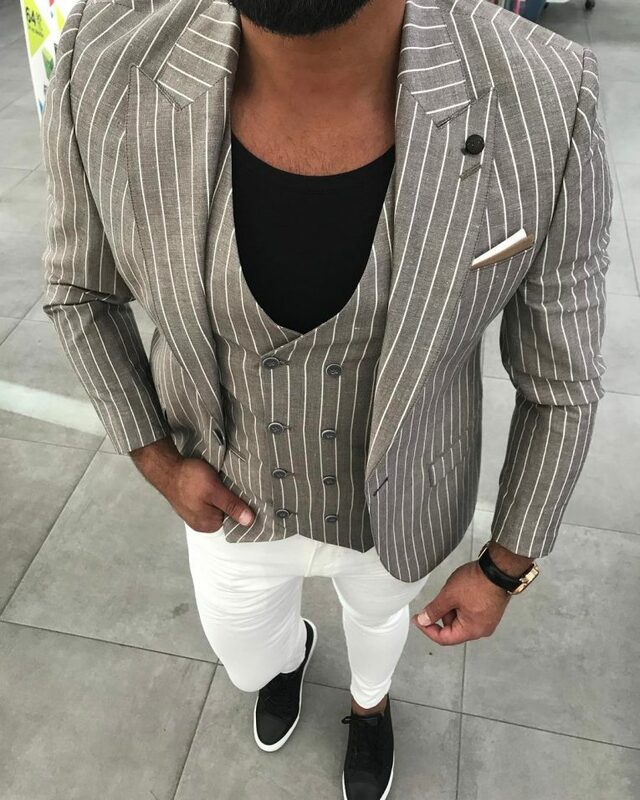 Just try to keep a contrast between the bottom and top parts of your outfits. 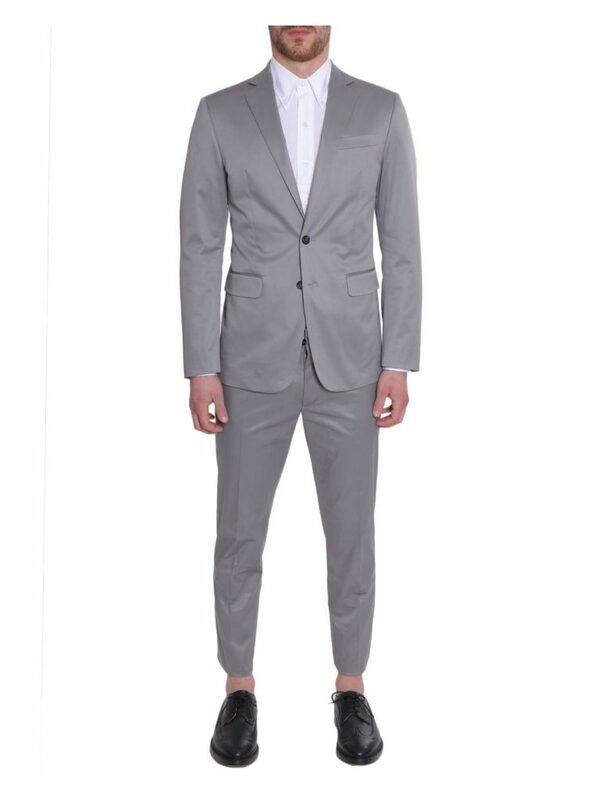 Play up the classic and casual nature of a gray suit or blazer without a neck tie. You can keep the top two buttons unbuttoned. 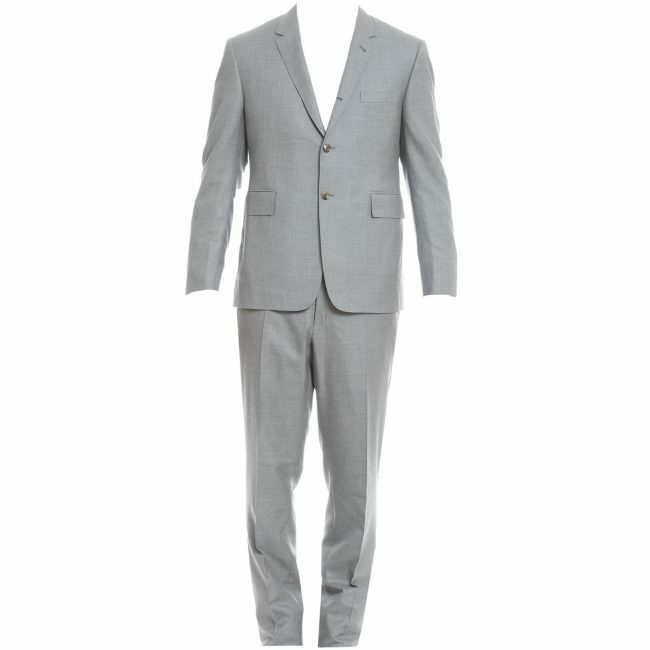 Here, you go with a subtle gray checked three-piece suit with a light blue shirt and dark green neck tie. 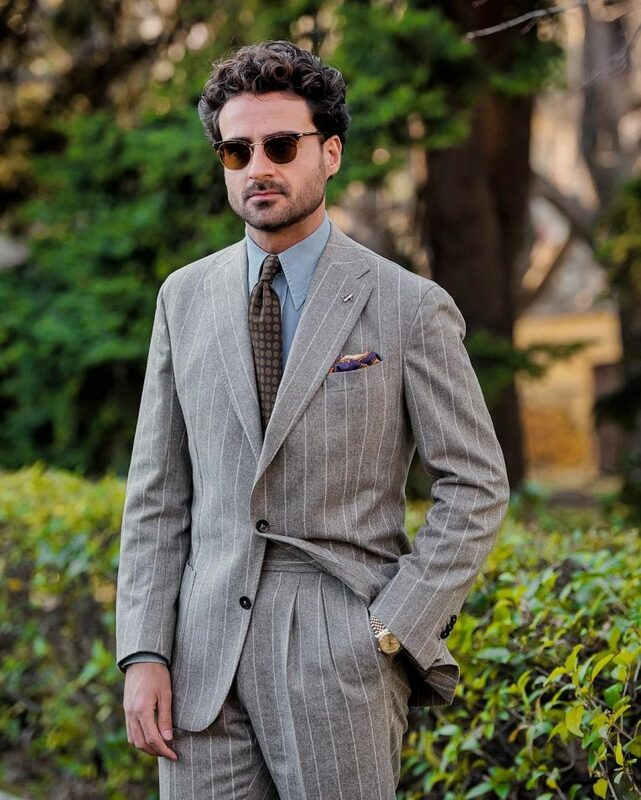 You can also choose a bold check three piece suit. 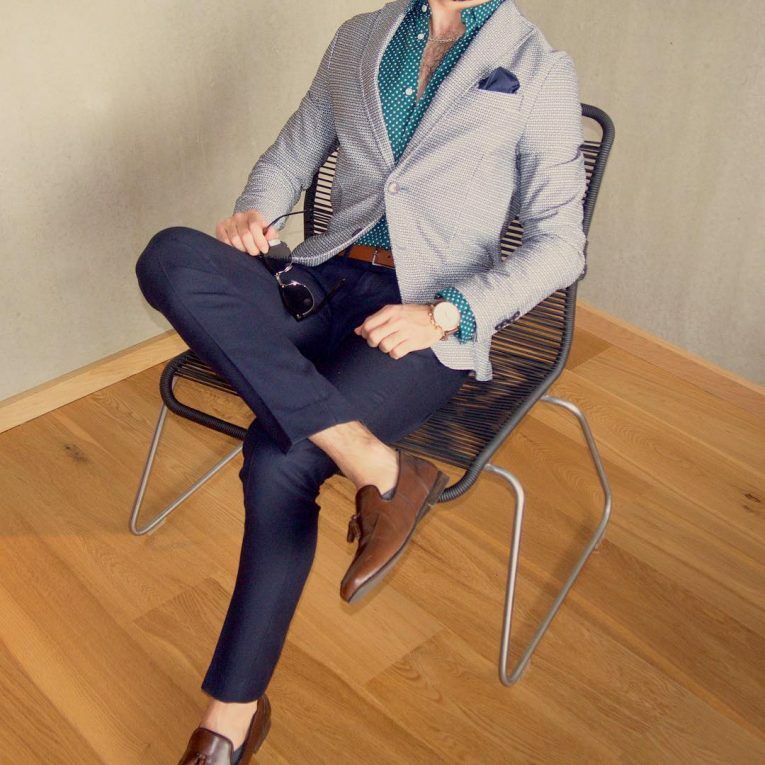 In this style, the color of your shoes matches that of your necktie. 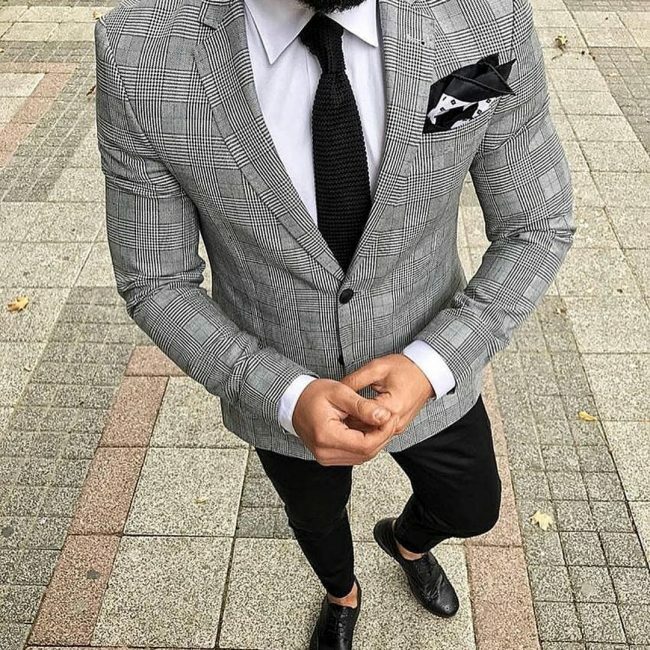 You can choose a pocket square of the same or different color. 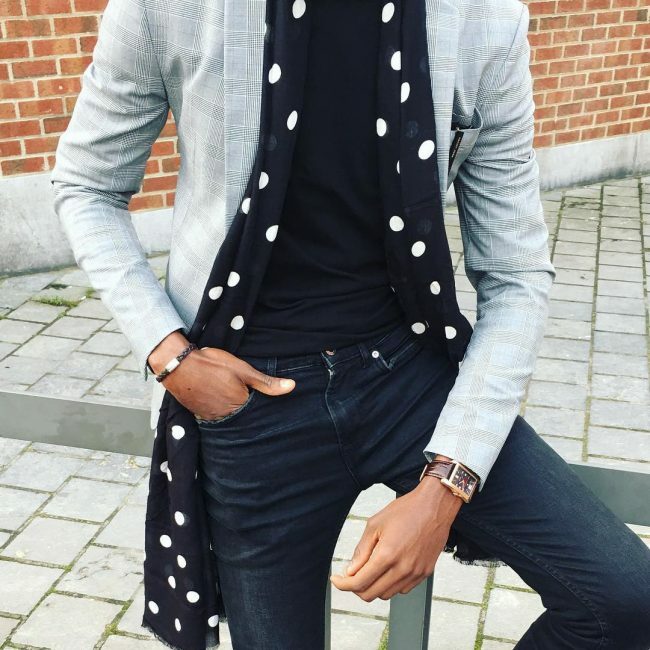 Skinny neckties are trendy and most popular among young men. 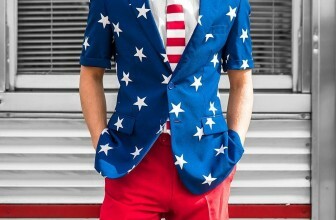 However, if not worn with the right suit color, they will look out of place. 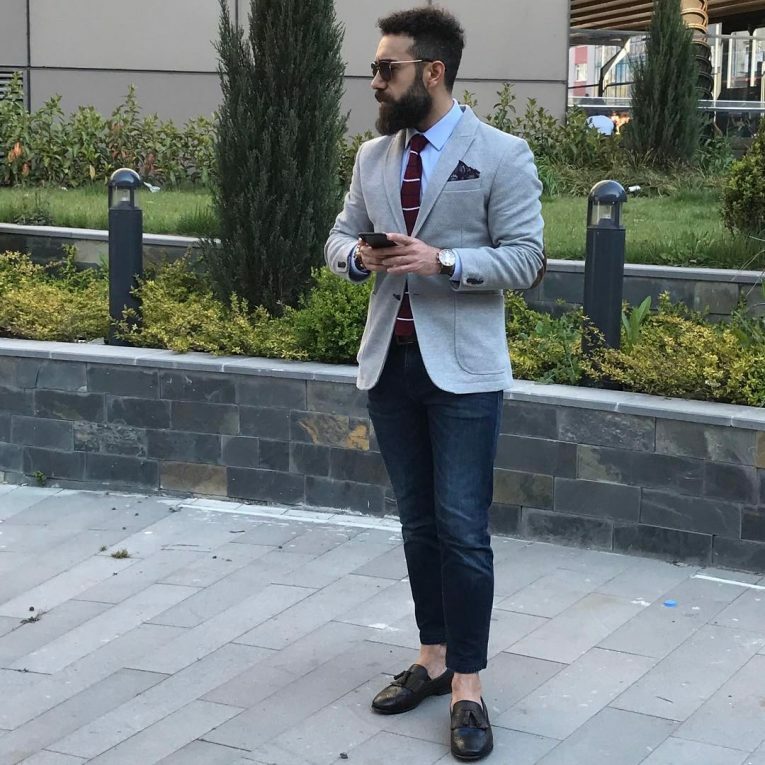 Brown loafers are the perfect luxury-casual footwear to rock with these types of suits. 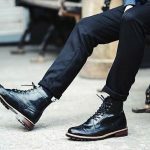 You can shop online for different designs of loafers from top brands. 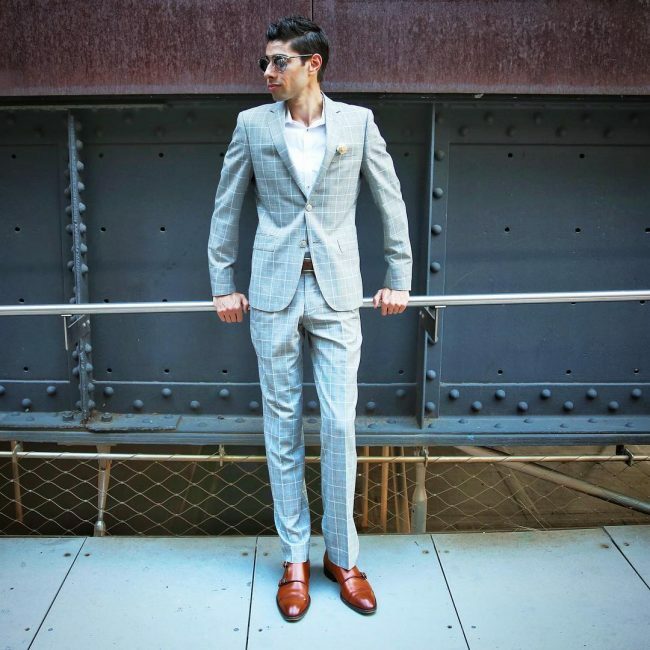 There is one of the recent trends that are being embraced by many suit enthusiasts. 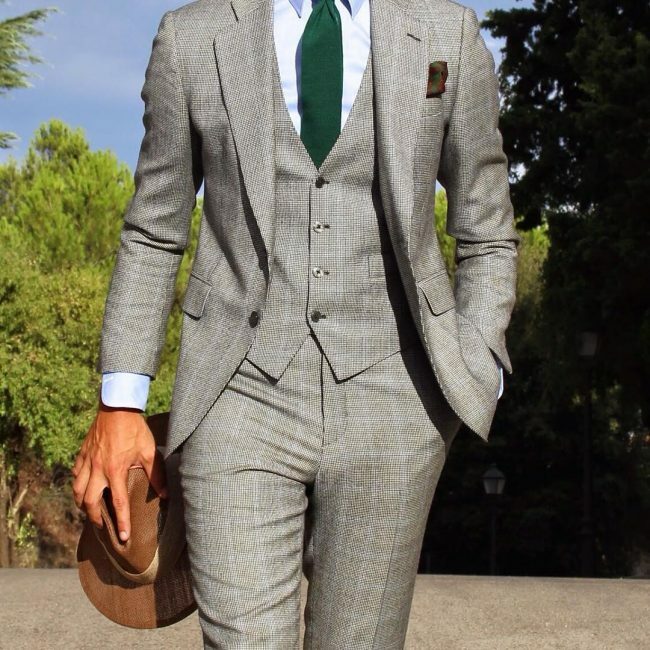 If you want to try this style, make sure your suit is a slim fitting modern suit. 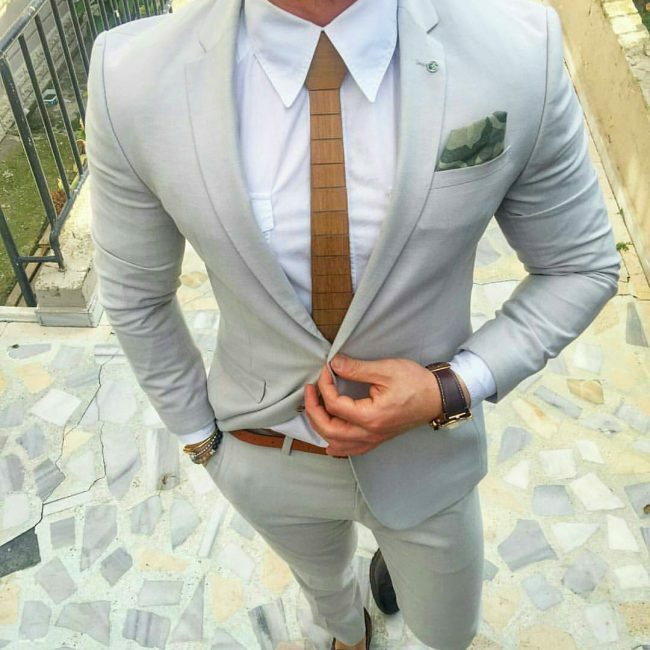 Make sure the brown tie that you want to wear with your suit does not look too plain. Too plain is a signal of someone with a dull personality. 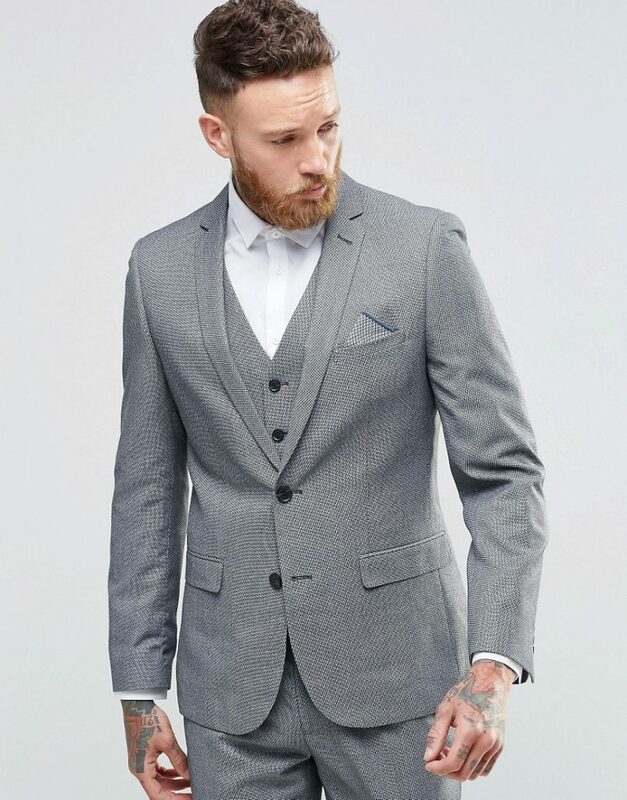 Go medium slim by wearing a skinny fit suit. 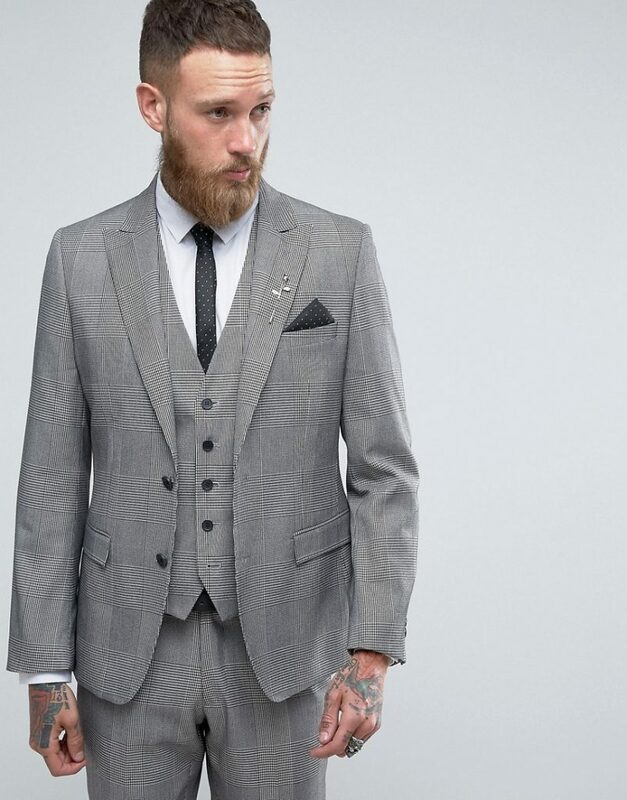 This style pulls out a shapely and modern approach to formal suits. 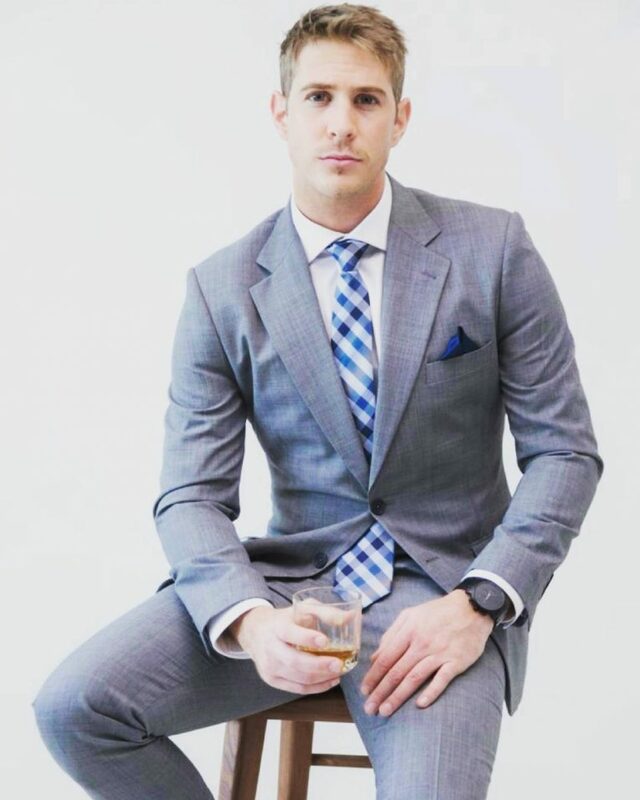 You can wear a tie or go tieless. 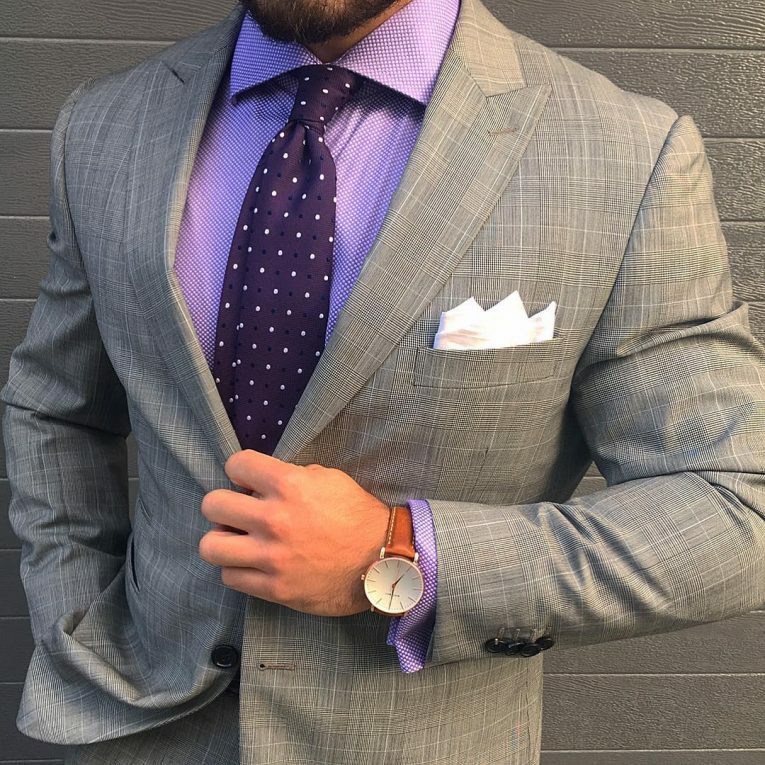 If you want to style a pink colored shirt for whatever reason, try it out with a gray suit. We also covered an article about ways to style a pink shirt. If you haven’t checked it yet, make sure you do. Wear patterned silk neckties to give your look a finishing touch. These ties have been designed to knot around neck effortlessly. The trend of wearing light colors has gained momentum in the recent times. 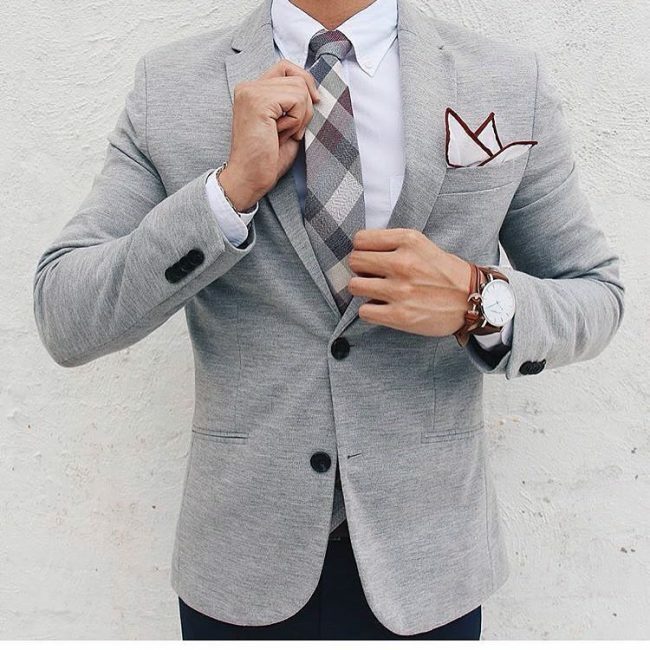 You can choose to pair your light gray suit with any light colored shirt. 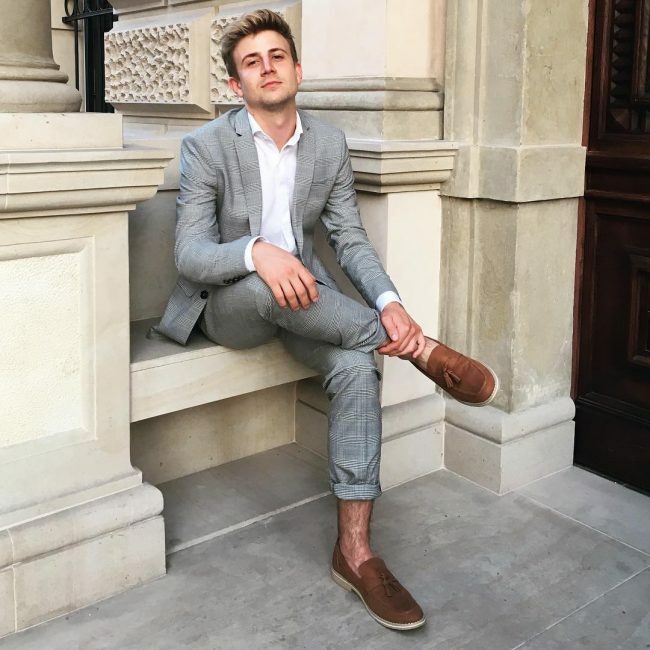 Ask many fashion enthusiasts they will tell you that pairing a gray suit with brown office shoes is better than black ones. 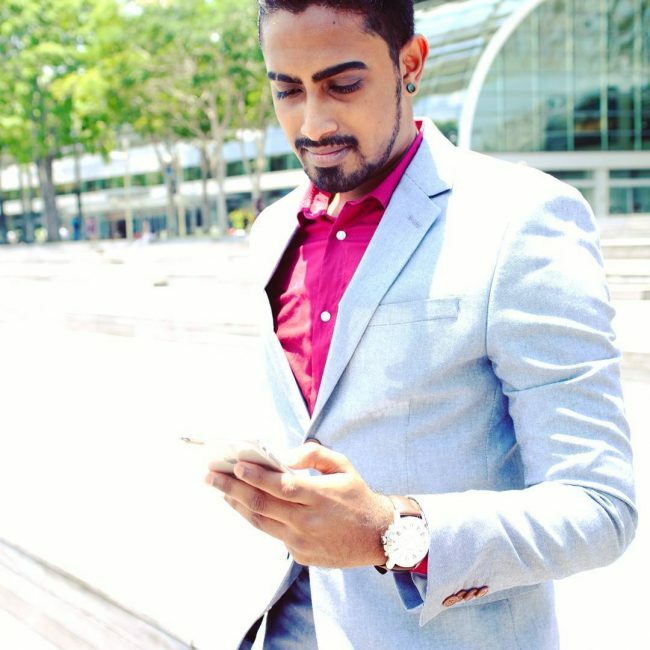 This style can work for you even if you are not working in an office environment. Purple outfits help you tell the world that you have the right to be proud of whom you are. Even a purple tie can communicate the same. 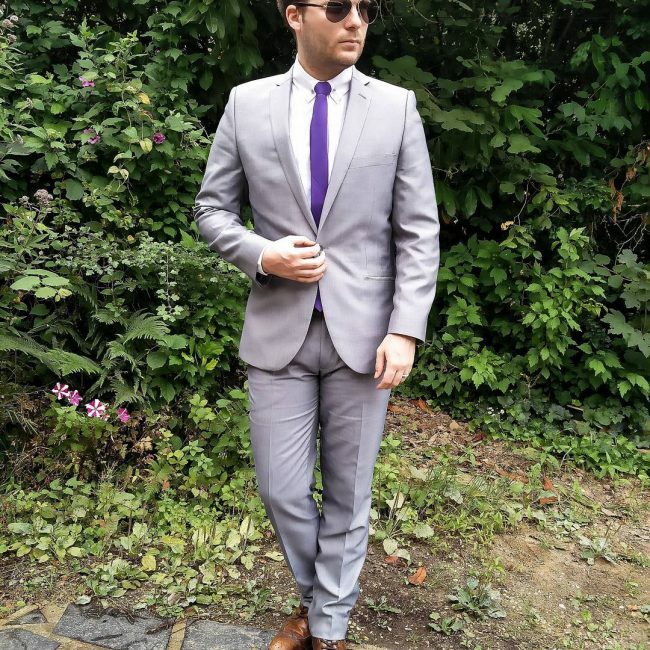 Wearing your gray suit with a tie is possible. 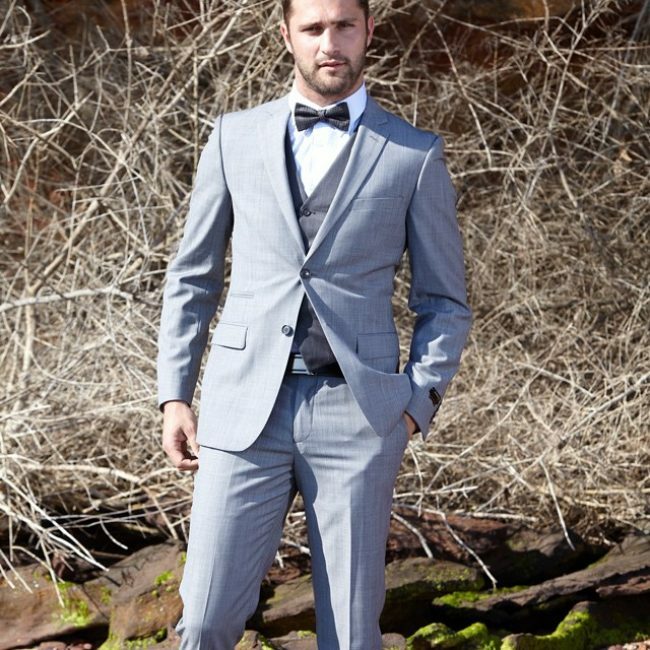 The best type of shirt to style with a bow tie is one with a button-down or hidden button collar. 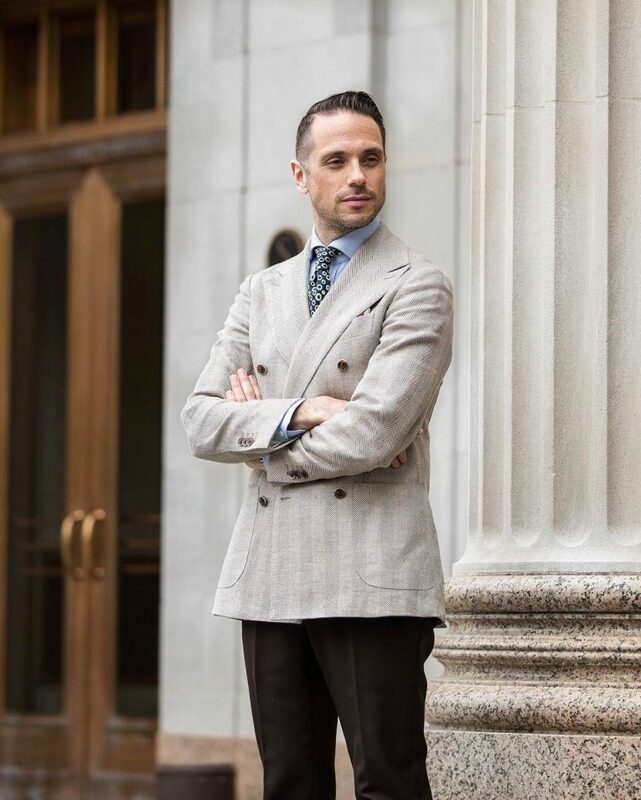 When choosing this type of shirt, make sure it is a light-colored one to compliment your gray suit. You can wear blue or light blue outfits to show those you love that you care about them. 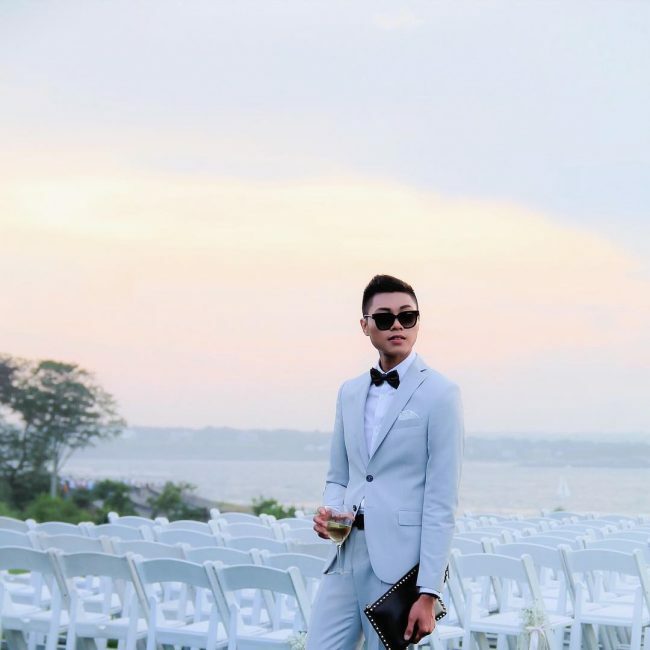 For this purpose, you can wear your suit with a white casual shirt and a light blue tie. 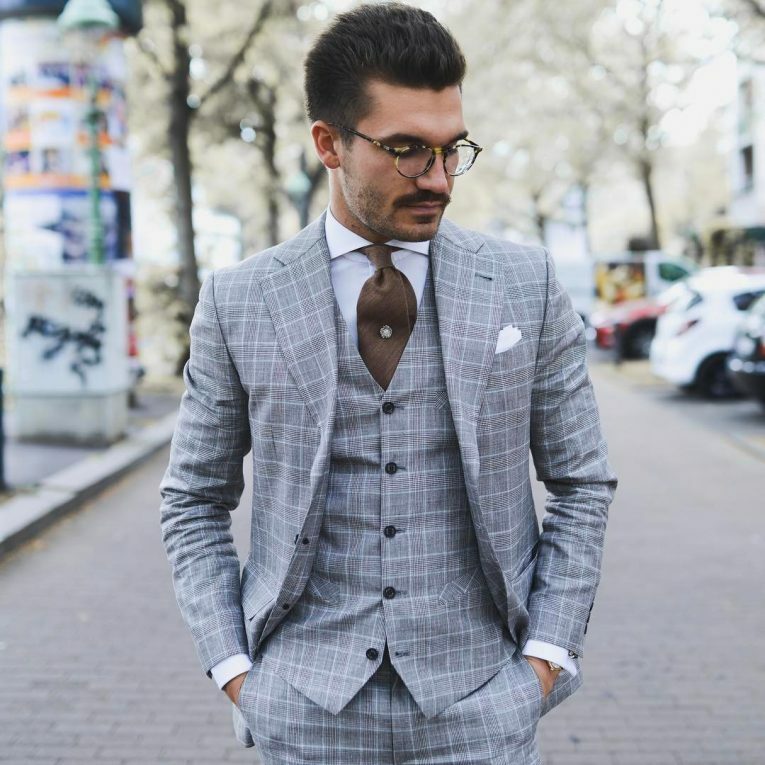 In this style, the color of your waistcoat matches that of your necktie. 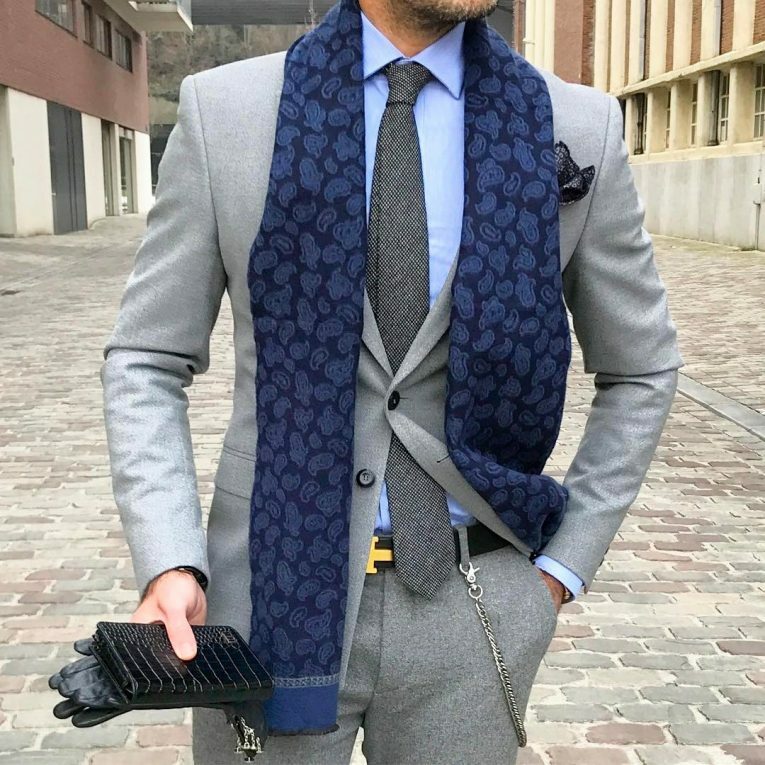 You can choose a pocket square of the same or different color. 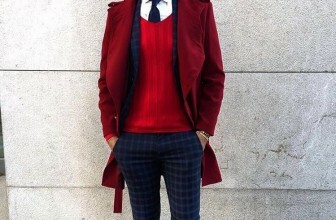 Tartan patterns have turned out to be one of the major men’s fashion trends. 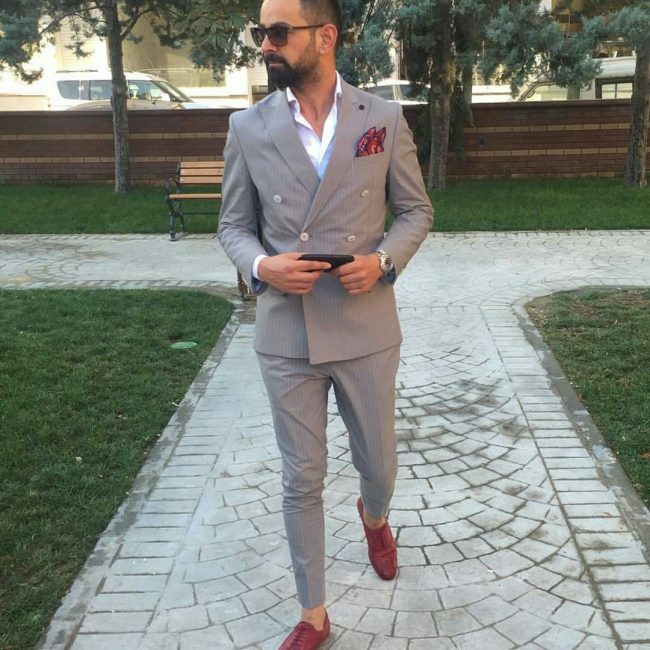 If you want to rock this style, try it with a plain blazer. 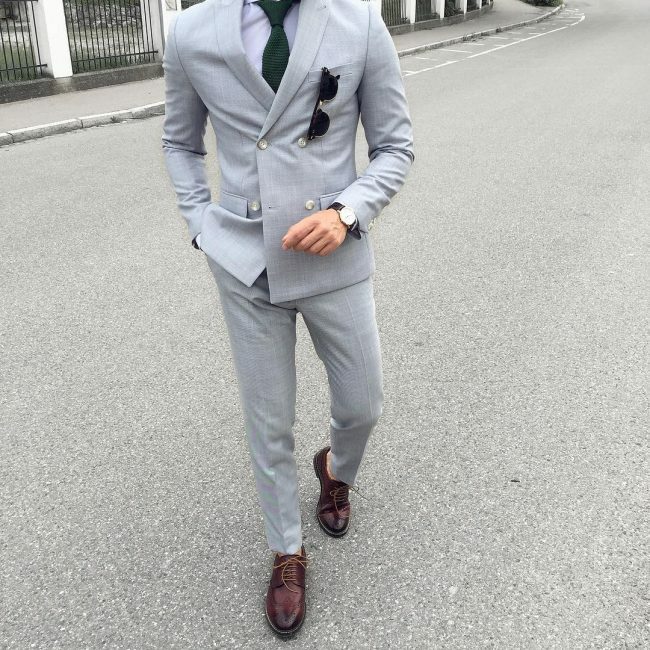 25 Amazing Gray Suit and Brown Shoes Combinations – Style and Elegance Redefined!